...and a video preview of each author to help you choose. In our rushed lives, popping in headphones has become a way to pass the time, when we’re in an Uber or waiting in line at the bank, on our commute or even washing the dishes. And audiobooks are increasingly a way for us to take pause for a few mindful minutes, to escape to some “me time” from anywhere. Even better: you can use these moments to learn about ways to make your life and work a little happier. I’m part of a movement dedicated to finding happiness at work, so I happen to think that becoming happier at work is pretty important! 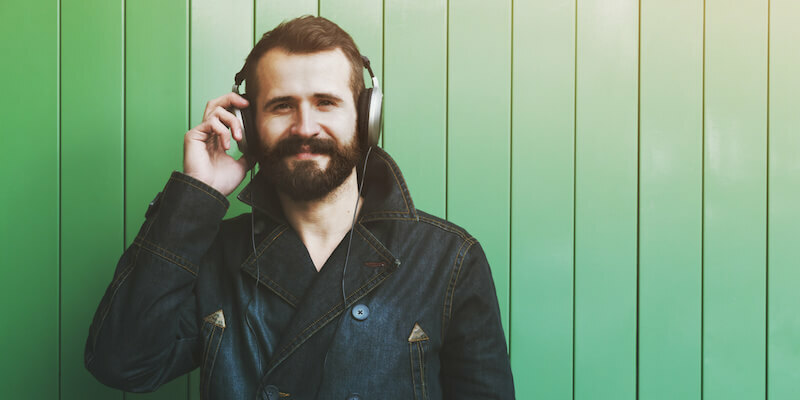 So today you’ll discover 4 hand-picked audiobooks that bring together the pleasure of listening to an inspiring author and actionable tips to find happiness in your daily grind. And to entice you even more to give ’em a listen, we’ve paired each book with a TED (or TED-like) talk from each author. Get ready to get happy! “If I work harder, I’ll be more successful. And if I’m more successful, then I’ll be happier.” This is the belief that many of us are wearing ourselves out trying to turn into a reality. In The Happiness Advantage: The Seven Principles of Positive Psychology that Fuel Success and Performance at Work, Sean Achor shares insight into the not-so-surprising theory that happy workers make for productive and successful assets. Watch Shawn’s lively TED talk to get a sense of his style. His 7 steps outline how to identify the not-so-average, even exceptional, members of your team, company or school; how to observe them; and how to figure out how to raise your average by doing things differently and focusing on the positive. And it’s all based on an approach that helps you and your colleagues to focus on optimism and the ability to see stress as a challenge rather than a stressful threat. If you give someone more money, they will work harder. This is the payment structure most businesses are based on. Yet a lot of the time, those of us bootstrapping our lives are happier than the big execs getting giant bonuses. In The Upside of Irrationality: The Unexpected Benefits of Defying Logic at Work and at Home, Dan Ariely explores the irrationality of this idea. Why can large bonuses make CEOs less productive? Of course, we have to make a living wage and meet our basic hierarchy of needs, but from there, money isn’t seen as a true motivator. So when money ceases to be a motivator, how do we motivate our employees? Dan highlights acknowledgement of behavior and a sense of satisfaction and ownership among strong motivators, and then he gives us actionable, small steps to easily take to make happier employees that are motivated for combined success. The competitive advantage of a shoe delivery business is…company culture? The story of Zappos is inspiring no matter what industry you work in. Delivering Happiness: A Path to Profits, Passion and Purpose sounds like a walk down memory lane. But Tony Hsieh offers tangible tips, too, to find new ways to measure success, culture and community in your company, to foster culture and values from entrance to exit interviews, and to clarify that culture. Perhaps what makes the story of Zappos most interesting is that it doesn’t only focus on happiness and motivators of employees, but on the happiness of managers, using experimentation and risk as a great way to generate happiness at work with success — because the further we move up the ladder and the longer we’ve been with a company, the more likely we are to play it safe. So many companies are focused on what they do and how they do it, but rarely take a moment to take a step back and ask why. Start with Why: How Great Leaders Inspire Everyone to Take Action focuses on that third question because that’s what gets people involved, engaged, committed and passionate. And of course those things lead to happier and more loyal workers. Simon Sinek’s most famous book is a great read not only for leaders but for anyone who yearns to find happiness and purpose in what they do. It’s also an enjoyable book to listen to if you like history, because he includes examples of how leaders successfully focused on why and in turn changed the world. While the ideas aren’t earth-shattering and some of his leadership examples will sound familiar, his great ability to tell a story makes this audiobook even more fun to listen to than it is to read. It’s an easy one to hear broken up over time or in a couple marathon days of listening. Which books have helped you be happier at work? Happier in general? Share them with us below or tweet your recommendation to @RedboothHQ!